There are many antiques in this photo, 74 to be exact, so I won't describe everything in detail like was done in our last ad/blog. Click on the highlighted objects for a longer description, measurements, and zoomable photo. I would like to share some of my thoughts that went into making this photo. 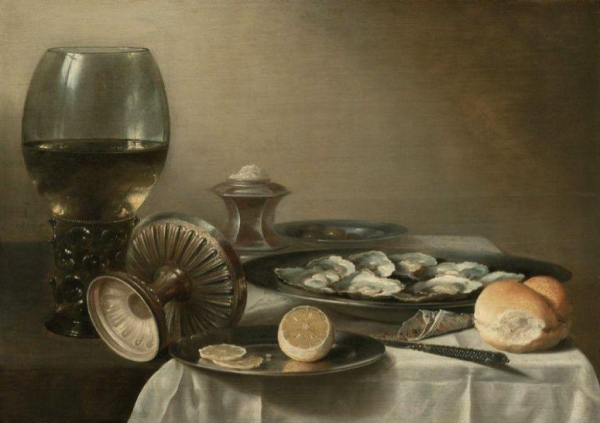 The composition of Dutch still life paintings range from the orderly and austere to the "pronkstilleven" (ostentatious still life). I find that my aesthetic design pendulum swings between these two genres. I think antiques can successfully occupy both worlds. In this photo I wanted to try and merge these two styles together in one image. 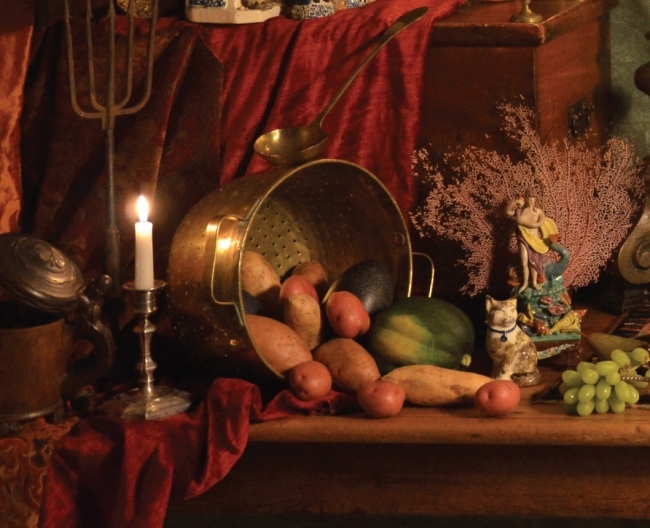 The composition of this month's ad was inspired by Frans Francken the Younger, a Flemish Baroque painter born in 1581. 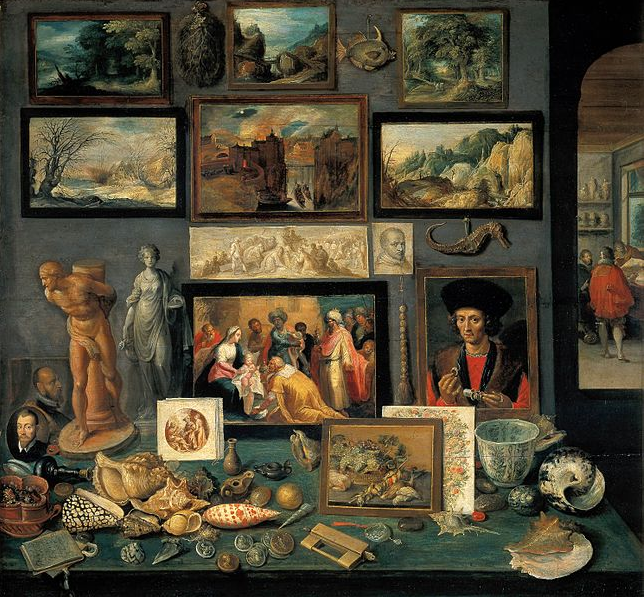 The structure of his Art Room painting of 1636 pictured below caught my eye as a good blueprint from which to start. For a visual example, in the book The Rhetoric of Perspective, Hanneke Grootenboer compares two works that embody these two genres. Concepts of the "horror vacui" meaning "fear of empty space", and the "void" are seen in the two works pictured below. You can see that these two paintings, to quote Grootenboer, have "pictorial elements that separates abundance from moderation, seduction from persuasion, and desire from restraint". 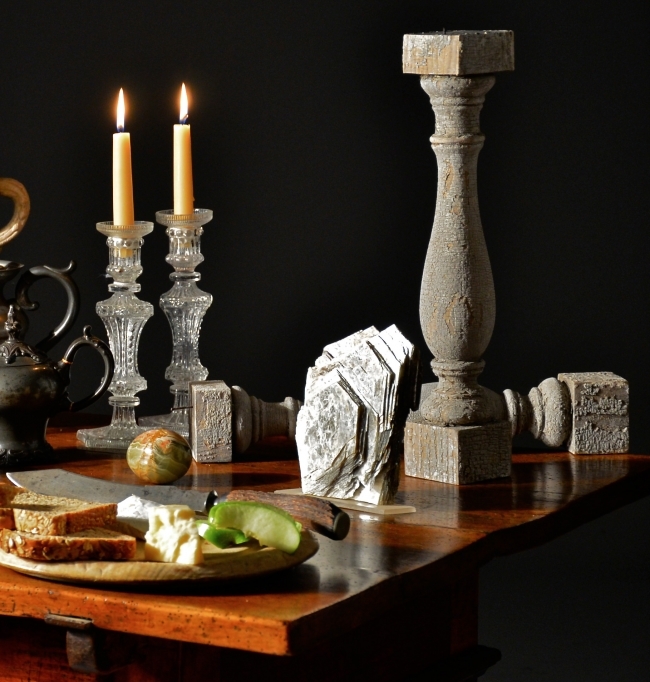 I placed a few traditional symbolic still life objects into this image. The piece of coral is seen as a protection against danger. 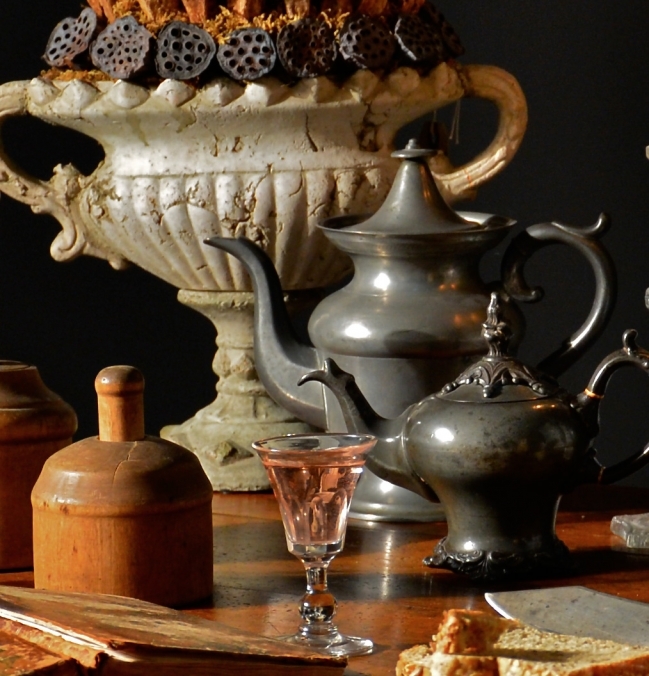 All the food and the wisp of smoke from the candle "extinguished" by the tipped kettle repeats the meaning of the title in this blog post. 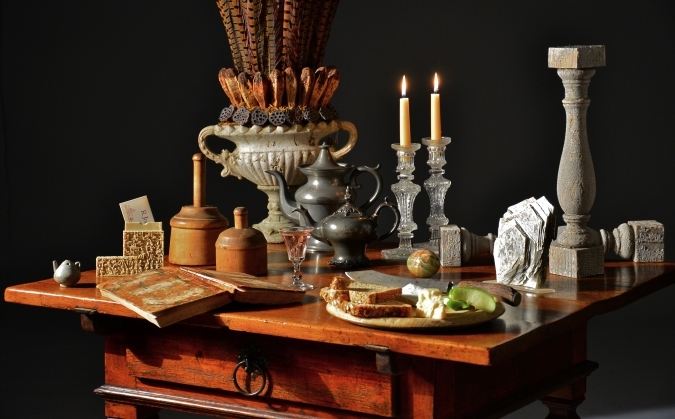 Pictured is a key, a few overhanging, turned-over, and balanced objects in the photo, typical of a Dutch still life symbolism. I wanted to have bubbles in the photo, but it wasn't working out so the floating blue hall light will have to do. Each food item is symbolic in some way, you can guess which ones are deliberate. The lemon and orange grouped together symbolizes temperateness, which I think defines the balance of " pronkstilleven" and the void. I will add that the lobsters are not representing Christ's resurrection but merely that our shop is in Maine, and yes, I ate them both after the photo shoot. Here is a closer look at the upper left of the photo. 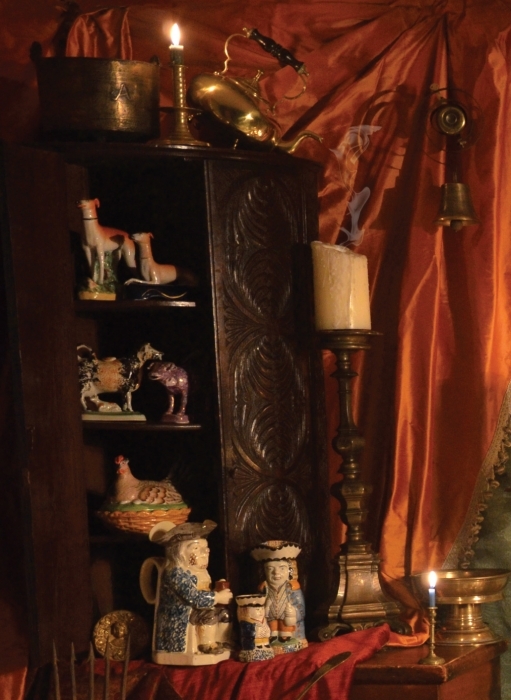 On top of the carved oak corner cupboard there is a Charles II candlestick, brass kettle, and brass pot. In the cupboard is a collection of Staffordshire and Prattware animal figures. There is a standing dog and one of a pair of sitting dogs, two cows and a hen. On the bottom shelf is one of a set of four brass tiebacks. To the right there is a group of 1, 2, 3, toby jugs of different sizes. 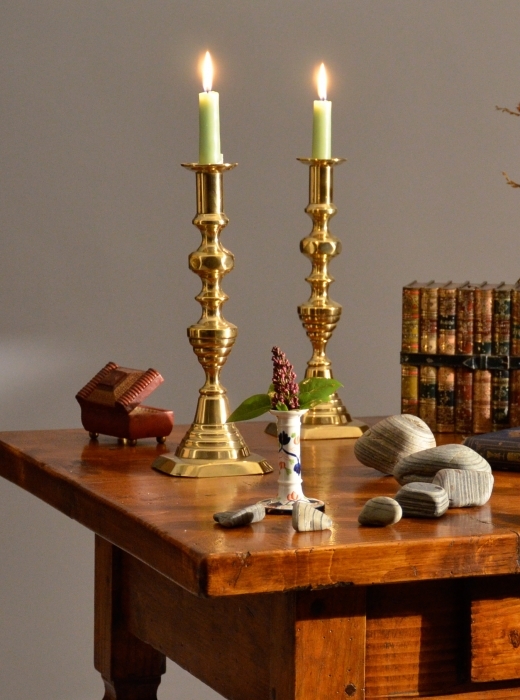 A small French candlestick, one of a pair, sits in front of a brass tazza and a large early Flemish candlestick, also one of a pair. Back at the top hangs a servant's bell. In the lower left detail there is a peg tankard, silver candlestick, one of a pair, iron eel fork, brass colander, Staffordshire cat, Venus with dolphins and shells, and a brass ladle in the balance between the colander and a grain painted blanket box. 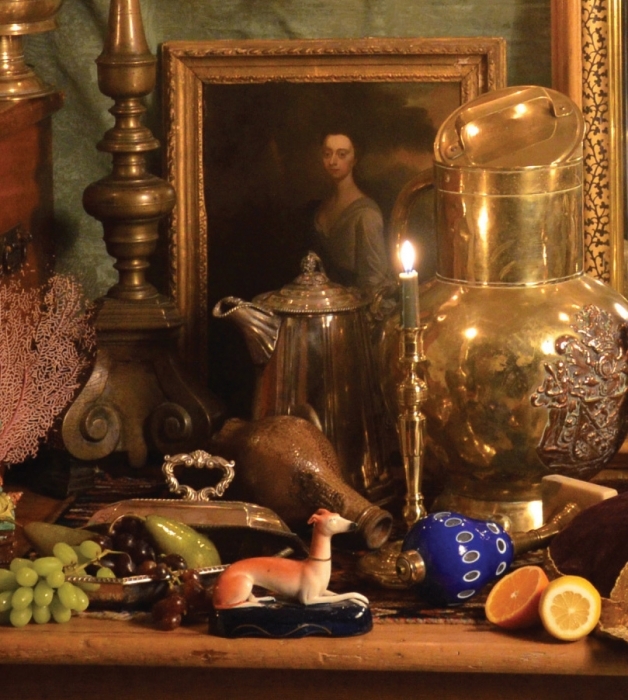 In this detail photo we see the companion to the hound inkwell in the corner cupboard, one of a pair of silver plate vegetable dishes, a blue glass lamp, a single brass candlestick, a fallen Bellarmine face jug in front of a silver-plate water pitcher, a framed portrait of a woman next to the base of a larger Flemish altar candlestick, one of a pair, a large Dutch brass milk jug with copper armorial, all resting on a small Kurdish rug. 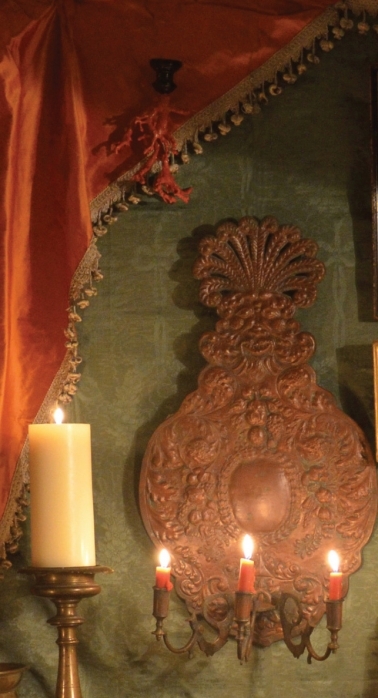 In this detail we now see the top of the Flemish candlestick, the green background bedspread, the piece of red coral, and a wonderful three light cast bronze sconce. Sorry, I must break my promise to keep the descriptions short. This sconce is very cool. 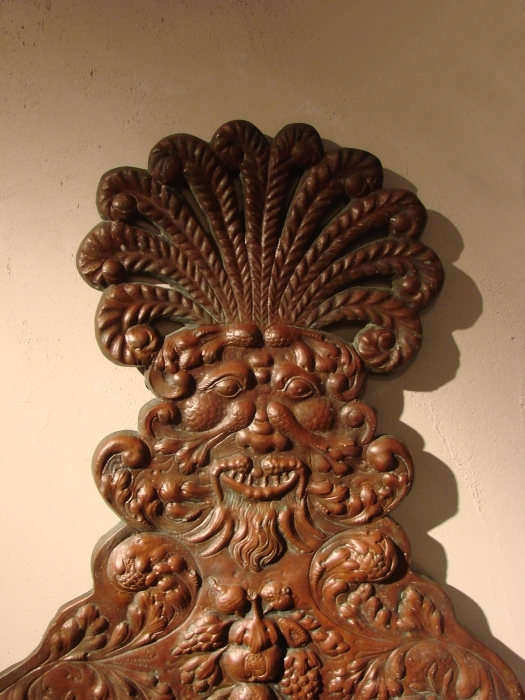 This three-light cast bronze sconce is fashioned in the manner of Giuseppe Arcimboldo. 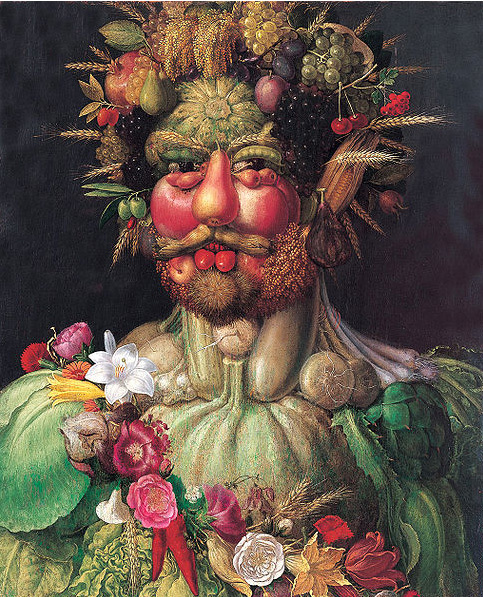 He is famous for painting "composed heads" made up of fruit, vegetables, fish, and flowers. 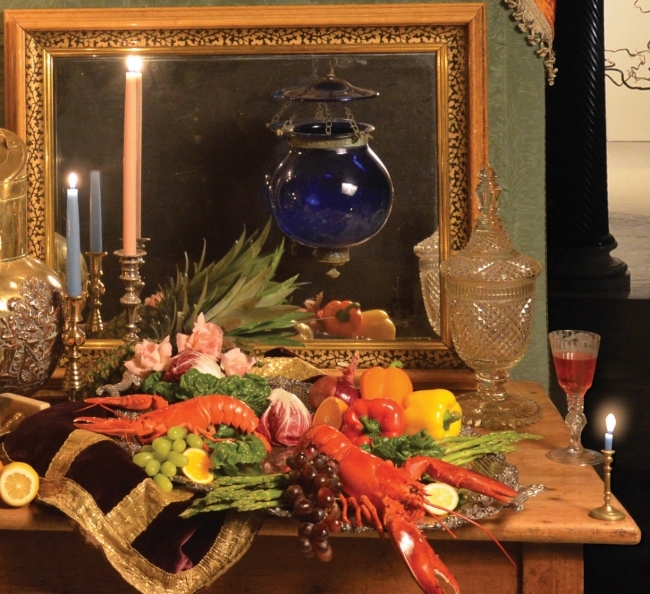 Looking closer you can see this bronze sconce portrait is made up of fruits, vegetables, and shrimp. The candle arms look like bearded Landsknecht mercenary soldiers. For a closer look please see this. In the lower right of this detail are two sweet small silk works worth a closer look here and here. 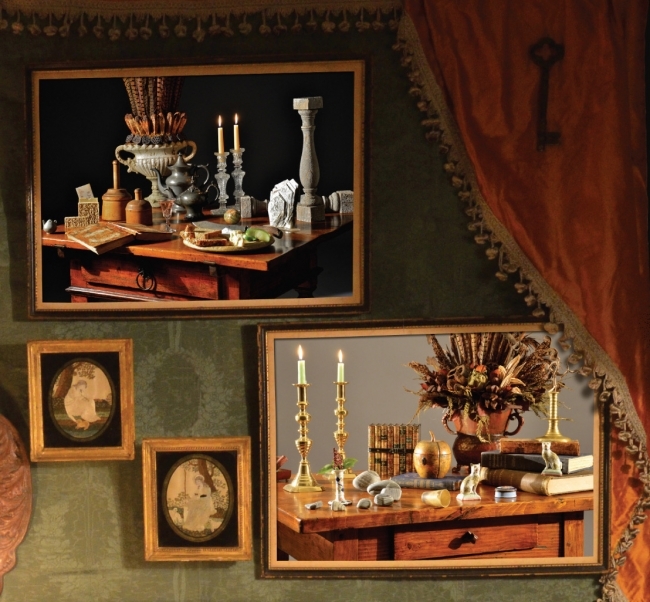 In the upper right corner returns the key enjoyed by a few people in the last ad, you know who you are :) The images in the simple frames are two more still life photos. Although they contribute to the photo's fullness, seen on their own these still life photos, I feel, are shifting away from the "pronkstilleven" and moving toward the void. 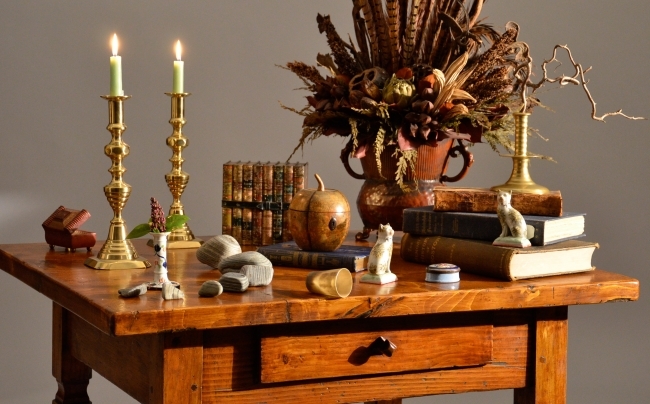 On this Hungarian coffee table from left to right is a tiny Qingbai water dropper, a carved ivory card carrier, two butter stamps big and small, a dried flower arrangement, wine glass, two pewter tea pots big and small, a pair of glass candlesticks, pair of balusters, bread board and knife, an egg shaped piece of jasper and a piece of mica. Here are a couple detail photos of the image above. 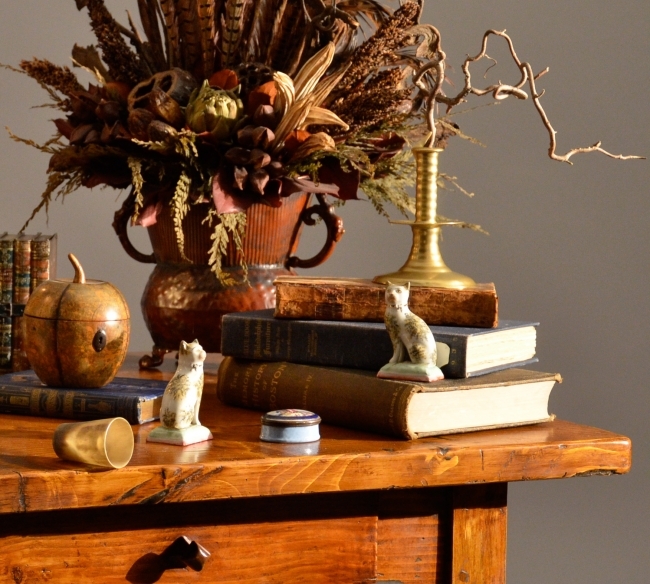 On this coffee table from left to right is a small leather box, pair of brass candlesticks, single pearlware candlestick, tin box in the form of stacked books, apple tea caddy, pair of staffordshire cats, dried flower arrangement, small Battersea box, a fallen horn cup, and a return visit of the Charles II candlestick. Here are a few detail shots and a different perspective of the above photo. Exploring the void, the background view is restrained in variety and color, in stark contrast to the foreground banquet scene. There are a pair of Anglo-Indian columns, a pair of wonderful trapezoidal mirrors, and a marble urn. 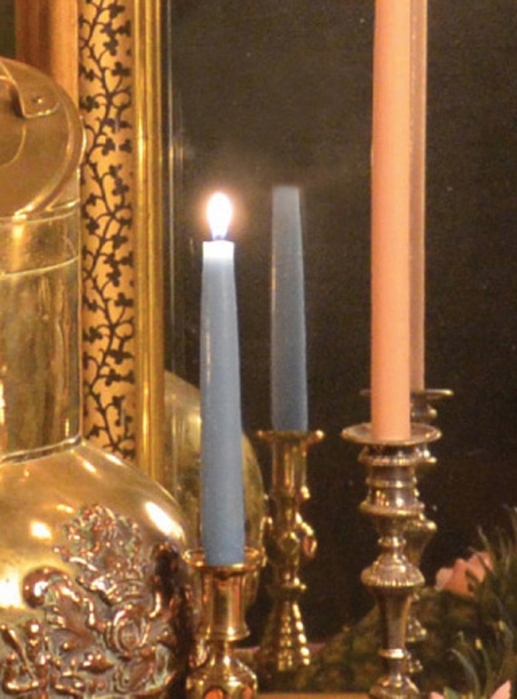 Back at the banquet there is a Russian mirror frame, a blue glass hall light, one of a pair, silver candlestick, one of a pair, a brass candlestick, one of a pair, cut glass urn, engraved wine glass, silver tray, the other small candlestick, all on a country pine table. 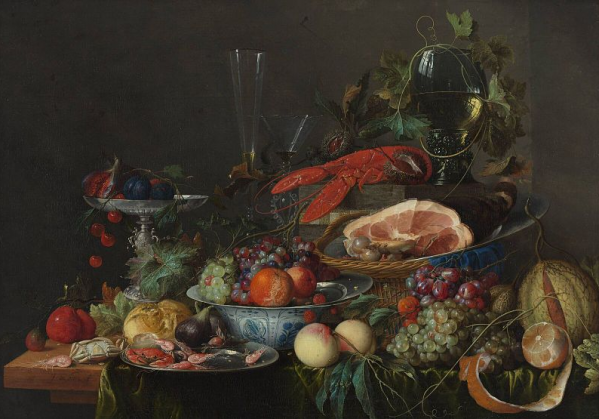 Many still life paintings are based around offering food and drink to unseen guests. When setting up this photo I was reminded of the Greek term philoxenia. It describes the concept and obligations of hospitality, kind acts of offering food and shelter to strangers. I feel this term could also apply to antiques. 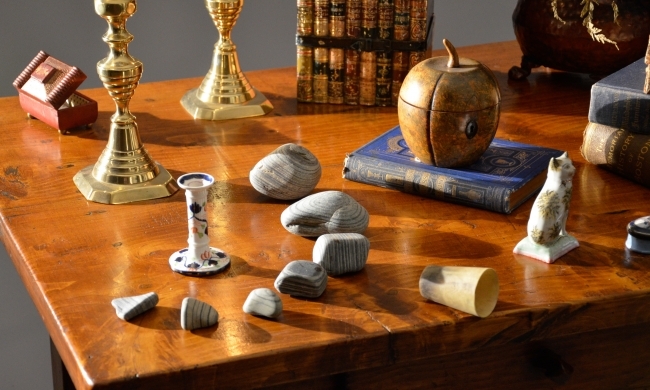 Most antiques are here today because they have been respected, sheltered, and cared for over the years. Buying an antique is to join in a long tradition of philoxenia. 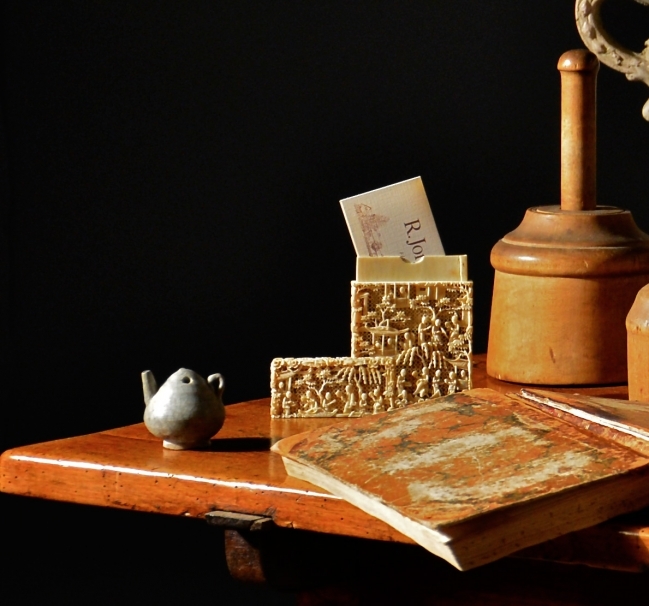 Possessing an antique is not about ownership but stewardship. When you acquire an antique object, it's not really joining your life, you are joining its journey through time. I really enjoy looking at and admiring the pair of trapezoidal mirrors seen in the background image above. I assume over the past 225 years countless numbers of others have enjoyed them as well. A lot of customers say to me "If these things could talk can you imagine the stories they could tell". It's fun to imagine all the people and what their unique circumstances were that have looked into that pair of mirrors. Thinking about all the stories and lost secrets hidden within these mirrors, and all these antiques, I enjoy the fact that I'm now a part of that secret history. To me that is the added value in antiques.